The savvy online investor manages her investment portfolio by allocating assets. Asset allocation and diversification help you spread your risk across various types of online investments. You can calculate how much risk you can tolerate and select a blend of investments to give you the highest return for that risk. Or, you can take a return-based approach that measures how much return you need to meet your goal and design a portfolio that can get you there. If you’re like most investors, the disappointment you feel when your portfolio falls more than you’d like is definitely greater than any happiness you might feel at eking out a slightly better-than-expected return. That’s why online tools that assess your appetite for risk, and then design a portfolio, make sense for many investors. IFA.com: Take the Index Fund Advisors offer a Risk Capacity Survey to determine what kind of investor you are. After you answer the questions, the Web site suggests one of several portfolios. 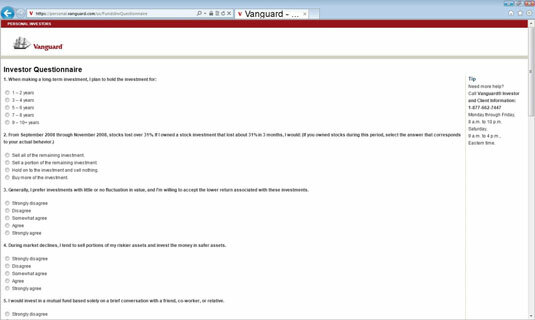 Vanguard’s Investor Questionnaire: The Vanguard questionnaire asks you ten questions in an attempt to determine how much risk you can stomach. At the end, the site recommends that you own certain mixes of short-term reserves, stocks, and cash. CNNMoney: CNNMoney steps you through four questions designed to figure out what kind of risk taker you are. It then generates a fairly basic asset allocation mix. Asset-Analysis: This site steps you through five questions that measure your appetite for risk. When you’re done, the site determines how much risk you can take and tells you how much of your portfolio should be invested in cash, bonds, emerging markets, domestic stocks, real estate, and international stocks. The other way to figure out how to allocate your portfolio is to first determine what kind of rate of return you need to reach your goal and then pick an asset allocation designed to get you there. 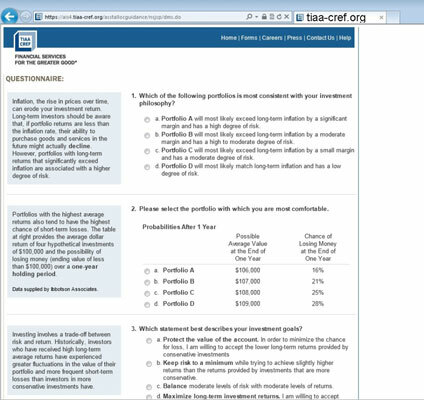 *TIAA CREF’s Asset Allocation Evaluator: If you want to determine your allocation on a specific goal, such as saving for college, this is a good tool for you. The first question it asks is what you’re saving for, such as retirement, education, or a first home. The site then asks you additional questions that are relevant to that specific goal. *Fidelity.com’s Portfolio Review: Use this tool to help you plan for a wide array of goals, ranging from retirement and education to more specific things like a vacation, wedding, or wealth accumulation. The Portfolio Review also studies how much risk you can stomach. The site can analyze your current portfolio and make suggestions on ways to improve and suggest an asset allocation. You don’t have to be a Fidelity account holder to use the system; you can sign up for a free membership instead. *Morningstar’s Asset Allocator: The Asset Allocator examines your financial goals and helps you choose the blend of cash, stocks, and bonds that will make it happen. The tool isn’t free, though, so you’ll have to pony up for a subscription to Morningstar Premium, which costs $189 a year. A free 14-day trial is available. *American Century Investment Planner: This planner starts by asking you what you’re saving for and then goes further to make suggestions. You need to register to use the site; however, you don’t need to have an account. Some brokers and mutual fund companies provide asset allocation tools to their customers. Mutual fund company T. Rowe Price, for instance, offers tools that analyze your portfolio and generate asset allocations to customers.